On April Fool’s Day, 1976, Steve Wozniak and Steve Jobs released the Apple I computer and started Apple Computers. 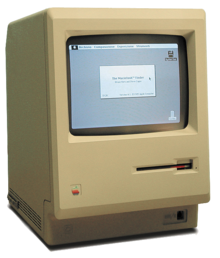 Eight years later in 1984, the Apple Macintosh (Mac) was released. The Mac has always had a small, but fiercely loyal fan base. Thirty years later, the Mac still has only 5% of the market. The joke of today is that the Mac isn’t that popular and Apple is now the world’s largest consumer electronics manufacturer. Although over 40% of Hollywood movies and TV shows show Macs because of Apple’s free giveaways, you don’t really see them in the real world except for specialty purposes. Pundits say this fact is because of the high cost, different operation, and limited 1 year warranty. While some fans try to re-write history to the contrary, Macintosh did so poorly that in 1997 Microsoft had to invest $150 million to prevent Apple’s demise. The release of the iPod in 2001 really saved the company. On January 9, 2007, Apple dropped “Computer” from its name and began in earnest the current mission into music and consumer electronics. By June of 2007, Apple released the iPhone which is the product mainly responsible for propelling the company to the powerhouse it is today. Shortly afterward in 2010, the iPad was released followed by a slew of products (iPad mini, iWatch, iTV, etc.) running on the same iOS platform. Mac is now on an island as the only product not running the iOS operating system. It’s a PC-like device running OS X derived from 2001 that still plays poorly with other platforms and applications. The Mac no longer fits the consumer electronics mission of Apple. Apple must decide either to integrate the Mac into the iOS ecosystem, discontinue the product altogether, or use its staggering wealth to come from behind and take another try at the computer industry.